Living in Austin for the past two-and-a-half years, I've learned that it's a city with a lot of opinions about its food scene, but the one almost unanimous opinion is that the best food trucks in town are the East Side King trucks owned by Chefs Paul Qui and Motoyasu "Moto" Utsunomiya. There are three East Side King trucks, The Liberty, The Shangri-La and The Grackle, each named for the bar that they're parked at. On July 1st, Paul and Moto closed the original Grackle truck to bring in a new truck with an updated menu. They found a shiny new truck that had purple vinyl wrap, decorated with cookies, and tapped artist and musician Yellow from the band Peelander-Z to paint the truck, making the cookies into the shell of a giant turtle reminiscent of Gamera, the giant evil turtle that battled Godzilla (it all makes sense when you see it, trust me). 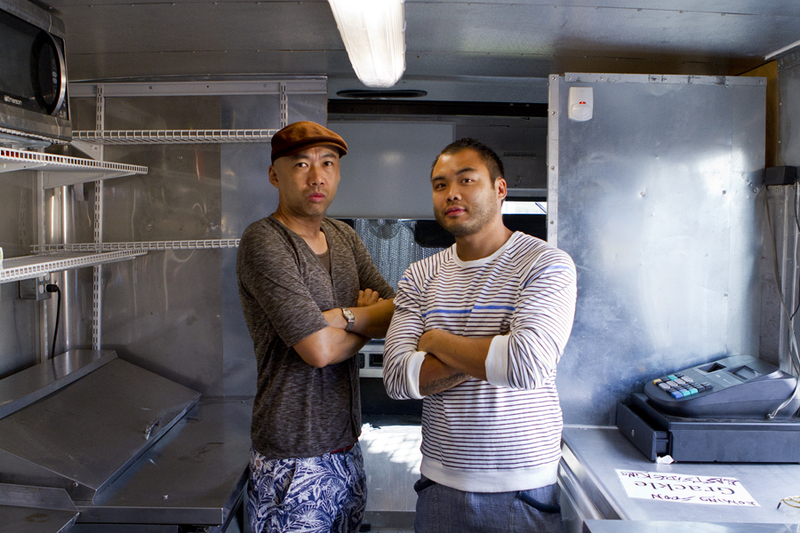 While the truck was being remodeled, Paul and Moto were hard at work creating a fresh menu that incorporates the Japanese idea of "BQ Gourmet" which is a sort of fast-food/gourmet hybrid. Paul and Moto make it their own by incorporating ingredients that you'd find here in Austin like quail and huge Texas pork steaks. With two more East Side King locations in the works (the first at Hole in the Wall, an Austin institution, and the brick-and-mortar restaurant that will most likely open next year) as well as Paul's own brick-and-mortar restaurant opening later this year, you have to wonder when this guy ever sleeps.